Need to widen your system functionality and connect your booking flow to other software? Zapier may help you to solve this in just few simple steps! 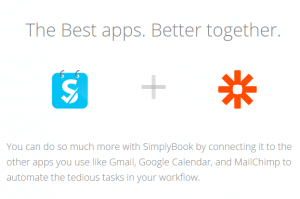 Zapier allows you to connect SimplyBook.me to hundreds of other web services. Automated connections called Zaps, set up in minutes with no coding, can automate your day-to-day tasks and build workflows between apps that otherwise wouldn’t be possible. Each Zap has one app as the **Trigger**, where your information comes from and which causes one or more **Actions** in other apps, where your data gets sent to automatically. Sign up for a free Zapier account and the wide choice of different web services will open up a new world of connections. How to connect SimplyBook.me to Zapier? Now click on search-box to look for “SimplyBook.me”. Use your credentials to connect your SimplyBook.me account to Zapier. Need inspiration? See everything that’s possible with SimplyBook.me and Zapier ready-made Zaps. Zapier with Simply is amazing! But we really need a trigger for “Cancellation” and “Rescheduled booking”, to truly automate everything!